Golda Meir[nb 1] (born Golda Mabovitch, Голда Мабович; Golda Meyerson/Myerson between 1917–1956; May 3, 1898 – December 8, 1978) was an Israeli teacher, kibbutznik, stateswoman and politician and the fourth elected Prime Minister of Israel. Meir was elected Prime Minister of Israel on March 17, 1969, after serving as Minister of Labour and Foreign Minister. The world's fourth and Israel's first and only woman to hold such an office, she has been described as the "Iron Lady" of Israeli politics, though her tenure ended before that term was applied to British Prime Minister Margaret Thatcher. Former Prime Minister David Ben-Gurion used to call Meir "the best man in the government"; she was often portrayed as the "strong-willed, straight-talking, grey-bunned grandmother of the Jewish people". Meir resigned as prime minister in 1974, the year following the Yom Kippur War. She died in 1978 of lymphoma. Golda Mabovitch (Ukrainian: Ґольда Мабович) was born on May 3, 1898, in Kiev, Russian Empire, present-day Ukraine, to Blume Neiditch (died 1951) and Moshe Mabovitch (died 1944), a carpenter. Meir wrote in her autobiography that her earliest memories were of her father boarding up the front door in response to rumours of an imminent pogrom. 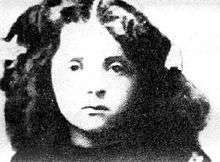 She had two sisters, Sheyna (1889–1972) and Tzipke (1902–1981), as well as five other siblings who died in childhood. She was especially close to Sheyna. Moshe Mabovitch left to find work in New York City in 1903. In his absence, the rest of the family moved to Pinsk to join her mother's family. In 1905, Moshe moved to Milwaukee, Wisconsin, in search of higher-paying work and found employment in the workshops of the local railroad yard. The following year, he had saved up enough money to bring his family to the United States. Blume ran a grocery store on Milwaukee's north side, where by age eight Golda had been put in charge of watching the store when her mother went to the market for supplies. Golda attended the Fourth Street Grade School (now Golda Meir School) from 1906 to 1912. A leader early on, she organised a fund raiser to pay for her classmates' textbooks. After forming the American Young Sisters Society, she rented a hall and scheduled a public meeting for the event. She went on to graduate as valedictorian of her class. At 14, she studied at North Division High School and worked part-time. Her mother wanted her to leave school and marry, but she demurred. She bought a train ticket to Denver, Colorado, and went to live with her married sister, Sheyna Korngold. The Korngolds held intellectual evenings at their home, where Meir was exposed to debates on Zionism, literature, women's suffrage, trade unionism, and more. In her autobiography, she wrote: "To the extent that my own future convictions were shaped and given form ... those talk-filled nights in Denver played a considerable role." In Denver, she also met Morris Meyerson (also "Myerson"; December 17, 1893 – May 25, 1951), a sign painter, whom she later married on December 24, 1917. In 1913 she returned to North Division High, graduating in 1915. While there, she became an active member of Young Poale Zion, which later became Habonim, the Labor Zionist youth movement. She spoke at public meetings, embraced Socialist Zionism and hosted visitors from Palestine. She attended the teachers college Milwaukee State Normal School (now University of Wisconsin–Milwaukee), in 1916, and probably part of 1917. After graduating from Milwaukee Normal, she taught in Milwaukee public schools. In 1917 she took a position at a Yiddish-speaking Folks Schule in Milwaukee. While at the Folks Schule, she came more closely into contact with the ideals of Labor Zionism. In 1913 she had begun dating Morris Meyerson (Myerson). She was a committed Labor Zionist and he was a dedicated socialist. Together, they left their jobs to join a kibbutz in Palestine in 1921. When Golda and Morris married in 1917, settling in Palestine was her precondition for the marriage. Golda had intended to make aliyah straight away but her plans were disrupted when all transatlantic passenger services were canceled due to the outbreak of World War I. Instead she threw her energies into Poale Zion activities. A short time after their wedding, she embarked on a fund raising campaign for Poale Zion that took her across the United States. The couple moved to Palestine in 1921 together with her sister Sheyna. In the British Mandate of Palestine, she and her husband joined a kibbutz. Their first application to kibbutz Merhavia in the Jezreel Valley was rejected, but later on they were accepted. Her duties included picking almonds, planting trees, working in the chicken coops, and running the kitchen. Recognizing her leadership abilities, the kibbutz chose her as its representative to the Histadrut, the General Federation of Labour. In 1924, the couple left the kibbutz and lived briefly in Tel Aviv before settling in Jerusalem. There they had two children, their son Menachem (1924–2014) and their daughter Sarah (1926–2010). 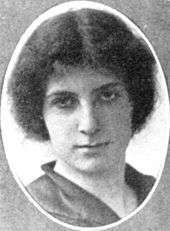 In 1928, Meir was elected secretary of Moetzet HaPoalot (Working Women's Council), which required her to spend two years (1932–34) as an emissary in the United States. The children went with her, but Morris stayed in Jerusalem. Morris and Golda grew apart, but never divorced. Morris died in 1951. In 1934, when Meir returned from the United States, she joined the Executive Committee of the Histadrut and she moved up the ranks to become the head of its Political Department. This appointment was important training for her future role in Israeli leadership. In July 1938, Meir was the Jewish observer from Palestine at the Évian Conference, called by President Franklin D. Roosevelt of the United States to discuss the question of Jewish refugees' fleeing Nazi persecution. Delegates from the 32 invited countries repeatedly expressed their sorrow for the plight of the European Jews, but they made excuses as to why their countries could not help by admitting the refugees. The only exception was by the Dominican Republic, which pledged to accept 100,000 refugees on generous terms. Meir was disappointed at the outcome and she remarked to the press, "There is only one thing I hope to see before I die and that is that my people should not need expressions of sympathy anymore." In June 1946, the British Government cracked down on the Zionist movement in Palestine, arresting many leaders of the Yishuv (see Black Sabbath). Meir took over as acting head of the Political Department of the Jewish Agency during the incarceration of Moshe Sharett. Thus she became the principal negotiator between the Jews in Palestine and the British Mandatory authorities. After his release, Sharett went to the United States to attend talks on the UN Partition Plan, leaving Meir to head the Political Department until the establishment of the state in 1948. In January 1948, the treasurer of the Jewish Agency was convinced that Israel would not be able to raise more than seven to eight million dollars from the American Jewish community. Meir traveled to the United States, and she raised $50,000,000, which was used to purchase arms in Europe for the young country. Ben-Gurion wrote that Meir's role as the "Jewish woman who got the money which made the state possible" would go down one day in the history books. On May 10, 1948, four days before the official establishment of Israel, Meir traveled to Amman, Jordan, disguised as an Arab woman for a secret meeting with King Abdullah I of Transjordan at which she urged him not to join the other Arab countries in attacking the Jews. Abdullah asked her not to hurry to proclaim a state. Meir replied: "We've been waiting for 2,000 years. Is that hurrying?" As the head of the Jewish Agency Political Department, Meir called the mass exodus of Arabs before the War of Independence in 1948 "dreadful", and she likened it to what had befallen the Jews in Nazi-occupied Europe. Golda Meir talks with Eva Perón in Argentina, 1951. Meir was one of 24 signatories (including two women) of the Israeli Declaration of Independence on May 14, 1948. She later recalled, "After I signed, I cried. When I studied American history as a schoolgirl and I read about those who signed the U.S. Declaration of Independence, I couldn't imagine these were real people doing something real. And there I was sitting down and signing a declaration of establishment." 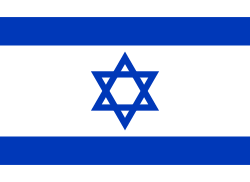 Israel was attacked the next day by the joint armies of neighboring countries in what became the 1948 Arab–Israeli War. During the war, Israel stopped the combined Arab assault, and then it launched a series of military offensives to defeat the invading Arab armies and to end the war. 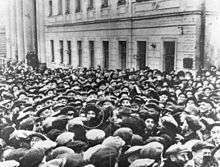 Meir surrounded by crowd of 50,000 Jews near Moscow Choral Synagogue on the first day of Rosh Hashanah in 1948. Carrying the first Israeli-issued passport, Meir was appointed Israel's minister plenipotentiary to the Soviet Union, with her term beginning on September 2, 1948, and ending in March 1949. At the time, good relations with the Soviet Union were important for Israel's ability to secure arms from Eastern European countries for the struggle that accompanied its independence, while Joseph Stalin and Soviet Foreign Minister Vyacheslav Molotov sought to cultivate a strong relationship with Israel as a means of furthering the Soviet position in the Middle East. Soviet–Israeli relations were complicated by Soviet policies against religious institutions and nationalist movements, made manifest in moves to shut down Jewish religious institutions as well as the ban on Hebrew language study and the prohibition of the promotion of emigration to Israel. During her brief stint in the USSR, Meir attended Rosh Hashanah and Yom Kippur services at the Moscow Choral Synagogue, where she was mobbed by thousands of Russian Jews chanting her name. The Israeli 10,000 shekel banknote issued in November 1984 bore a portrait of Meir on one side and the image of the crowd that turned out to cheer her in Moscow on the other. In 1949 Meir was elected to the Knesset as a member of Mapai and served continuously until 1974. From 1949 to 1956, she served as Minister of Labour. While serving in this position, Meir carried out welfare state policies, orchestrated the integration of immigrants into Israel’s workforce, and introduced major housing and road construction projects. From 1949 to 1956, 200,000 apartments and 30,000 houses were built, large industrial and agricultural developments were initiated, and new hospitals, schools, and roads were built. Meir also helped in the development of the National Insurance Act of 1954, which introduced Israel’s system of social security, together with the country’s maternity benefits programme and other welfare measures. In 1956, she became Foreign Minister under Prime Minister David Ben-Gurion. Her predecessor, Moshe Sharett, had asked all members of the foreign service to Hebraicize their last names. Upon her appointment as foreign minister, she shortened "Meyerson/Myerson" to "Meir", which means "illuminate". As foreign minister, Meir promoted ties with the newly established states in Africa in an effort to gain allies in the international community. But she also believed that Israel had experience in nation-building that could be a model for the Africans. In her autobiography, she wrote: "Like them, we had shaken off foreign rule; like them, we had to learn for ourselves how to reclaim the land, how to increase the yields of our crops, how to irrigate, how to raise poultry, how to live together, and how to defend ourselves." Israel could be a role model because it "had been forced to find solutions to the kinds of problems that large, wealthy, powerful states had never encountered". Meir's first months as Foreign Minister coincided with the Suez Crisis, which is also known as the Second Arab-Israeli War, the Tripartite aggression (in Arab countries), Sinai Campaign and Operation Kadesh (by the Israeli government) and others. It involved an invasion of Egypt in late 1956 by Israel, followed by Britain and France. The aims were to regain Western control of the Suez Canal, remove Egyptian president Nasser, and provide a more secure western border and freedom of navigation through the Straits of Tiran for Israel. Meir was involved in planning and coordination with the French government and military prior to the start of military action. During United Nations debates about the crisis, Meir took charge of the Israeli delegation. After the fighting had started, the United States, the Soviet Union, and the United Nations forced the three invaders to withdraw. As a result of the conflict, the United Nations created the UNEF military peacekeeping force to police the Egyptian–Israeli border. Meir with U.S. President John F. Kennedy, 27 December 1962. On October 29, 1957, she was slightly injured in the foot when a Mills bomb was thrown into the debating chamber of the Knesset. David Ben-Gurion and Moshe Carmel were more seriously injured. The attack was carried out by 25-year-old Moshe Dwek. Born in Aleppo, his motives were attributed to a dispute with the Jewish Agency, though he was also described as being "mentally unbalanced". In 1958, Meir was recorded as having praised the work of Pope Pius XII on behalf of the Jewish people shortly after the pontiff's death. Pope Pius's legacy as a wartime pope were controversial into the 21st century. The same year, during the wave of Jewish migration from Poland to Israel, Meir sought to prevent disabled and sick Polish Jews from immigrating to Israel. In a letter sent to Israel's ambassador in Warsaw, Katriel Katz, she wrote: "A proposal was raised in the coordination committee to inform the Polish government that we want to institute selection in aliyah, because we cannot continue accepting sick and handicapped people. Please give your opinion as to whether this can be explained to the Poles without hurting immigration." In the early 1960s, Meir was diagnosed with lymphoma. In January 1966, she retired from the Foreign Ministry, citing exhaustion and ill health, but soon returned to public life as secretary-general of Mapai, supporting Prime Minister Levi Eshkol in party conflicts. Meir (center) with Pat and Richard Nixon in 1973. US President Richard Nixon and Israeli Prime Minister Golda Meir meeting on 1 March 1973 in the Oval Office. Nixon's National Security Advisor Henry Kissinger is to the right of Nixon. After Levi Eshkol's sudden death on February 26, 1969, the party elected Meir as his successor. 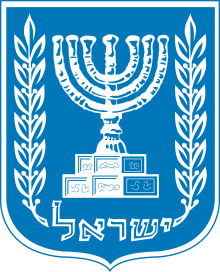 Meir came out of retirement to take office on March 17, 1969, serving as prime minister until 1974. 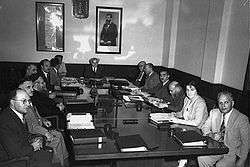 Meir maintained the national unity government formed in 1967, after the Six-Day War, in which Mapai merged with two other parties (Rafi and Ahdut HaAvoda) to form the Israeli Labor party. Six months after taking office, Meir led the reconfigured Alignment, comprising Labor and Mapam, into the 1969 general election. The Alignment managed what is still the best showing for a single party or faction in Israeli history, winning 56 seats—the only time a party or faction has even approached winning an outright majority in an election. The national unity government was retained. In 1969 and the early 1970s, Meir met with many world leaders to promote her vision of peace in the Middle East, including Richard Nixon (1969), Nicolae Ceaușescu (1972) and Pope Paul VI (1973). In 1973, she hosted the chancellor of West Germany, Willy Brandt, in Israel. In August 1970, Meir accepted a U.S. peace initiative that called for an end to the War of Attrition and an Israeli pledge to withdraw to "secure and recognized boundaries" in the framework of a comprehensive peace settlement. The Gahal party quit the national unity government in protest, but Meir continued to lead the remaining coalition. On 28 February 1973, during a visit in Washington, D.C., Golda agreed with Henry Kissinger's peace proposal based on "security versus sovereignty": Israel would accept Egyptian sovereignty over all Sinai, while Egypt would accept Israeli presence in some of Sinai strategic positions. In the wake of the Munich massacre at the 1972 Summer Olympics, Meir appealed to the world to "save our citizens and condemn the unspeakable criminal acts committed". Outraged at the perceived lack of global action, she ordered the Mossad to hunt down and assassinate suspected leaders and operatives of Black September and PFLP. The 1986 TV film Sword of Gideon, based on the book Vengeance by George Jonas, and Steven Spielberg's movie Munich (2005) were based on these events. During the 1970s about 200,000 Russian-Jewish emigrants were allowed to leave the Soviet Union for Israel by way of Austria. When seven of these emigrants were taken hostage at the Austria–Czechoslovakia border by Palestinian militants in September 1973, the Chancellor of Austria, Bruno Kreisky, closed the Jewish Agency's transit facility in Schönau, Austria. A few days later in Vienna, Meir tried to convince Kreisky to reopen the facility by appealing to his own Jewish origin, and described his position as "succumbing to terrorist blackmail". Kreisky did not change his position, so Meir returned to Israel, infuriated. A few months later, Austria opened a new transition camp. In the days leading up to the Yom Kippur War, Israeli intelligence could not conclusively determine that an attack was imminent. However, on October 5, 1973, Meir received official news that Syrian forces were massing on the Golan Heights. The prime minister was alarmed by the reports, and felt that the situation reminded her of what happened before the Six-Day War. Her advisers, however, assured her not to worry, saying that they would have adequate notice before a war broke out. This made sense at the time, since after the Six-Day War, most Israelis felt it unlikely that the Arabs would attack. Consequently, although a resolution was passed granting her power to demand a full-scale call-up of the military (instead of the typical cabinet decision), Meir did not mobilize Israel's forces early. Soon, though, war became very clear. Six hours before the outbreak of hostilities, Meir met with Minister of Defense Moshe Dayan and general David Elazar. While Dayan continued to argue that war was unlikely and thus was in favor of calling up the air force and only two divisions, Elazar advocated full scale army mobilization and the launch of a full-scale preemptive strike on Syrian forces. Meir approved full scale mobilizing but sided with Dayan against a preemptive strike, citing Israel's need for foreign aid. She believed that Israel could not depend on European countries to supply Israel with military equipment, and the only country that might come to Israel's assistance was the United States. Fearing that the United States would be wary of intervening if Israel were perceived as initiating the hostilities, Meir decided early on October 6 against a preemptive strike. She made it a priority to inform Washington of her decision. U.S. Secretary of State Henry Kissinger later confirmed Meir's assessment by stating that if Israel had launched a preemptive strike, Israel would not have received "so much as a nail". She decided wisely, with common sense and speedily, in favour of the full mobilization of the reserves, as recommended by the chief-of-staff, despite weighty political considerations, thereby performing a most important service for the defence of the state. Her party won the elections in December 1973, but she resigned on April 11, 1974, bowing to what she felt was the "will of the people" and what she felt was a sufficient premiership as well as the pending pressures of forming a coalition; "Five years are sufficient ... It is beyond my strength to continue carrying this burden." Yitzhak Rabin succeeded her on June 3, 1974. In 1975 she published her autobiography, My Life. On December 8, 1978, Meir died of lymphatic cancer in Jerusalem at the age of 80. 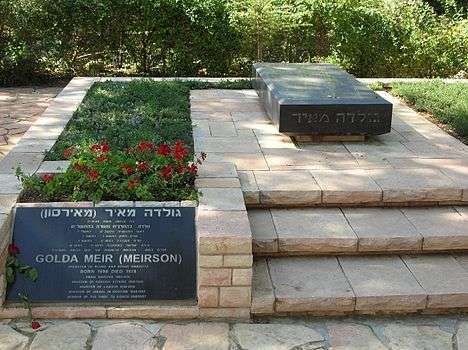 Four days later, on December 12, Meir was buried on Mount Herzl in Jerusalem. In 1975, Meir was awarded the Israel Prize for her special contribution to society and the State of Israel. In 1974, Meir was awarded the honor of World Mother by American Mothers. In 1974 Meir was awarded the James Madison Award for Distinguished Public Service by Princeton University's American Whig–Cliosophic Society. Meir's story has been the subject of many fictionalized portrayals. In 1977, Anne Bancroft played Meir in William Gibson's Broadway play Golda. The Australian actress Judy Davis played a young Meir in the television film A Woman Called Golda (1982), opposite Leonard Nimoy. Ingrid Bergman played the older Meir in the same film. In 2003, American Jewish actress Tovah Feldshuh portrayed her on Broadway in Golda's Balcony, Gibson's second play about Meir's life. The one-woman show was controversial in its implication that Meir considered using nuclear weapons during the Yom Kippur War. Valerie Harper portrayed her in the touring company production and in the film version of Golda's Balcony. Actress Colleen Dewhurst portrayed her in the 1986 TV movie Sword of Gideon. In 2005 actress Lynn Cohen portrayed Meir in Steven Spielberg's film Munich. Tovah Feldshuh assumed the role of Meir once again in the 2006 English-speaking French movie O Jerusalem. She was played by the Polish actress Beata Fudalej in the 2009 film The Hope by Márta Mészáros. Israeli 10 New Sheqalim Banknote commemorating Golda Meir (1985–1992). In Israel, the term "Golda's shoes" (na'alei Golda) has become a reference to the sturdy orthopedic shoes that Golda favored. These shoes were also supplied to women soldiers in the Israeli army from its foundation to 1987. ↑ "Golda Meir: An Outline of a Unique Life: A Chronological Survey of Gola Meir's Life and Legacy". The Golda Meir Center for Political Leadership (Metropolitan State University of Denver). Retrieved February 20, 2014. Reference on name pronunciation (see "1956"). ↑ Yitzhak Shargil and Gil Sedan. "State Funeral Will Be Held Tuesday for Golda Meir Who Died Friday at the Age of 80." Jewish Telegraphic Agency 11 Dec 1978. 1 2 3 Golda Meir: An Outline Of A Life Metropolitan State College of Denver, mscd.edu; accessed November 22, 2015. ↑ Elinor Burkett Golda Meir; The Iron Lady of the Middle East, Gibson Square, ISBN 978-1-906142-13-1 p. 37. ↑ "MJHnyc.org" (PDF). Retrieved September 2, 2011. ↑ "Golda Meir: Peace and Arab Acceptance Were Goals of Her 5 Years as Premier". New York Times. December 9, 1978. ↑ "Golda". The Emery/Weiner School. Archived from the original on July 2011. ↑ Pine, Dan. "Golda Meir's life was devoted to building Zionism". San Francisco Jewish Community Publications. Archived from the original on August 2012. Retrieved July 15, 2005. ↑ "Biography". Morim Madrichim. Retrieved January 31, 2013. ↑ Flatt, J.M.M. (2012). Powerful Political Women: Stirring Biographies of Some of History's Most Powerful Women. iUniverse. p. 172. ISBN 9781462068197. Retrieved December 3, 2014. ↑ Reich, B. (1990). Political Leaders of the Contemporary Middle East and North Africa: A Biographical Dictionary. Greenwood Press. p. 329. ISBN 9780313262135. Retrieved December 3, 2014. ↑ My Life. p. 232. She 'wasn't very pleased' with B.G. and was 'enraged' by the religious bloc. ↑ Robert William St. John, Ben Gurion. Jarrods Publishers (Hutchinson Group), London. 1959. pp. 304–306. ↑ "Jewish Gratitude for the Help of Pope Pius XII Who helped them against the perverse regime of the Nazis". Catholicapologetics.info. Retrieved September 2, 2011. ↑ "Golda Meir wanted to keep sick Poles from making aliyah". Jewish Telegraphic Agency. December 9, 2009. ↑ "Golda Meir" Encyclopaedia Judaica, Keter, Jerusalem, 1972, pp. 1242–44. ↑ Yitzhak Rabin (1996). The Rabin Memoirs. University of California Press. p. 215. ISBN 978-0-520-20766-0. security versus sovereignty"... Israel would have to accept Egyptian sovereignty over all the Sinai, while Egypt, in turn, would have to accept Israeli military presence in certain [Sinai] strategic positions. ↑ P.R. Kumaraswamy (11 January 2013). Revisiting the Yom Kippur War. Routledge. pp. 105–. ISBN 978-1-136-32888-6. In February 1973, Kissinger held talks with Sadat's National Security Advisor, Hafez Ismail. ... memoirs that Kissinger told him that, on the basis of his conversations with Hafez Ismail, Egypt might be ready to start negotiating if Israel acknowledged Egyptian sovereignty over all of Sinai. Rabin consulted with Prime Minister Golda Meir and told Kissinger that Israel authorized him to explore this approach. ↑ Morris, B. (2001) . Righteous Victims: A History of the Zionist–Arab Conflict, 1881–2000. New York: Vintage Books. ISBN 0-679-74475-4. ↑ Avner, Yehuda (2010). The Prime Ministers: An Intimate Narrative of Israeli Leadership. The Toby Press. p. 219. ISBN 978-1-59264-278-6. ↑ "(German)". Historisch.apa.at. September 28, 1973. Retrieved September 2, 2011. 1 2 3 4 5 Meir, Golda (1975). My Life. G. P. Putnam's Sons. ↑ "Israel Prize Official Site – Recipients in 1975 (in Hebrew)". ↑ "Past National Mothers of The Year". ↑ "UN Secretariat Item: Letter – The American Whig-Cliosophic Society : James Madison Award for Distinguished Public Service – 1974 – Golda Meir" (PDF). Archives-trim.un.org. Retrieved November 25, 2012. ↑ wallyg Wally Gobetz+ Add Contact. "Golda Meir Square". Flickr.com. Retrieved September 2, 2011. ↑ "Israel's Women GIs Kick Off 'Golda Shoes'". Los Angeles Times. Tel Aviv. AP. 11 May 1987. Retrieved October 3, 2013. Agrees, Elijahu (1969). Golda Meir: Portrait of a Prime Minister. Sabra Books. ISBN 0-87631-020-X. Meir, Menahem (1983). My Mother Golda Meir: A Son's Evocation of Life With Golda Meir. Arbor House Publishing Company. ISBN 0-87795-415-1. Skard, Torild (2014) "Golda Meir" in Women of Power – Half a century of female presidents and prime ministers worldwide. Bristol: Policy Press, ISBN 978-1-44731-578-0. Syrkin, Marie (1969). Golda Meir: Israel's Leader. Putnam. Wikimedia Commons has media related to Golda Meir. Prime Minister Golda Meir – Israeli Prime Minister's Office.